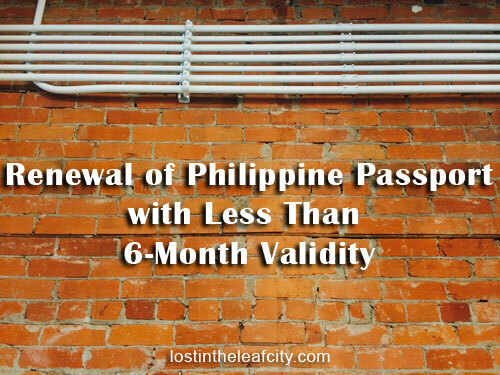 You are here: Home / Immigration / Penalty In Renewing Philippine Passport With Less Than 6-Month Validity? International regulations require travelers to carry valid travel documents during their journey. As such, you will be UNABLE to travel using an expired Philippine passport. If you are a Filipino citizen, you may apply for the renewal of your passport or for a one-way travel document (refer to option 2 in this post) at the nearest Philippine Embassy or Consulate General in your area. Kindly note the requirements for passport application. For more information, you may wish to contact our Consular Section at telephone number (613) 233-1121. This is the question that crossed my mind the same as one of the readers. NO. There’s no penalty if you want to renew the Philippine passport even if it is going to expire in less than six months. You can even travel back to the Philippines but be aware of the consequences on your way back. More onto that later. In (almost) every post I wrote about the Philippine passport, I keep on reminding Filipinos to immediately renew the passport before it reaches the 6-month validity. Although I sound annoying which is a fact; here is another fact to enlighten us with the magic number six. Why only six months? How about twelve months. As you can see on the list, Philippines and other countries have adapted the 6-month passport validity on arrival. Some even require less. Afghanistan, Algeria, Bhutan, Botswana, Brunei, Cambodia, Comoros, Côte d’Ivoire, Ecuador, Egypt, El Salvador, Fiji, Guyana, Indonesia, Iran, Iraq (except when arriving at Basra – 3 months and Erbil or Sulaimaniyah – on arrival), Israel, Kenya, Laos, Madagascar, Malaysia, Marshall Islands, Myanmar, Namibia, Nicaragua, Nigeria, Oman, Palau, Papua New Guinea, Philippines, Rwanda, Saint Lucia, Samoa, Saudi Arabia, Singapore, Solomon Islands, Sri Lanka, Suriname, Taiwan, Tanzania, Timor-Leste, Tonga, Tuvalu, Uganda, Vanuatu, Venezuela, and Vietnam. Countries requiring passport validity of at least 4 months on arrival: Micronesia and Zambia. Georgia, Honduras, Iceland, Jordan, Kuwait, Lebanon, Moldova, Nauru, Panama, United Arab Emirates, and Schengen Area. Eritrea, Hong Kong, Macao, New Zealand, and South Africa. Can’t find a country? Other countries require the passport holder to present valid passport or valid throughout the period of intended stay. I decided to explore the effects of using a passport beyond the required validity period on arrival to the destination. Scenario #1: Going back to the Philippines. I’ve stumbled upon the blog, Best Life Qatar by Zeke on which he wrote about his experience of travelling in the Philippines beyond the 6-month passport validity. It’s a fortunate story for one of our kababayan. Let me know in the comment if you have the same fate. While we may all wish to travel in the Philippines without getting into trouble, this may not happen for some. Do not take the risk. It is always best to renew the Philippine passport way beyond the validity on arrival of every country. So you do have different options to avoid traveller’s nightmare here in Canada and in the Philippines. For the unfortunate who is caught up with the nightmare of having an expired Philippine passport, a Travel Document is the last resort, but ONLY in case of emergency. While reading stories about the scenario of going back to the Philippines and daring the policy and authority, I wondered how things will turn out in a different country. Scenario #2: Arriving in countries other than the Philippines. I have to include this part because this just might be the motivation needed for our kababayan to always have a valid passport and renew at least a year prior to expiration. A US citizen was denied entry to the Philippines. An Australian citizen was denied to board the flight to Bali, Indonesia. Some agencies wouldn’t confirm the passport validity requirement of the destination. It is your duty to know the facts. Again, do not take the risk of ruining your trip. Plan everything ahead of time. The stories I’ve discovered were just few of the stories available on the Internet. What about the untold stories not found in forums and blogs. Although I love hearing inspiring stories for this post, I’ll appreciate stories with travel lessons from unpleasant experience. If you have a story to tell, can you leave a comment. Everything should be clear by now: follow the rules. Government of Canada: Travel Advice and Advisories – learn the latest travel update before leaving from Canada. Find out the entry/exit requirements and more. Tip: You have many choices in getting a new Philippine passport. You can book an online appointment, walk in, and visit a consular outreach program all while you are in Canada. I run out of reminders and tips to write about but maybe you have some. Leave a comment. Resources: Wikipedia: Passport validity and ripadvisor. « Accredited Agencies In The Philippines Offering Jobs In Canada? Hi, Carol! This is very helpful and informative. My Dad is going home to the Philippines on May1 and will come back to Canada on May 30th. His Philippine passport expires on November 11 2017, meaning by the time he travels back to Canada, his passport will expire in 5months and 11days which is below 6months validity. We are permanent residents in Canada. Do you think my Dad will be allowed to come back to Canada with less than 6months expiration pf passport? Also, I have read from your website that if he applies for passport renewal in the Philippines there is a faster one which will only take 10 working days? You can check this post about getting a passport in the Philippines. Making an online appointment is required and the availability in different DFA offices vary so I suggest you to check the availability and make an appointment in advance and also inquire how fast is the processing. Hi I just have a Little problem and I hope you guys can help me out … I am going to travel back home this December 16 and going back to Sweden janaury 7 2018. And I am already a permanent resident here in Sweden. Is it possible to travel back to Sweden with a passport with not more than 2 months it will expire.. I really don’t know what to do now. I’ve been calling the embassy and I haven’t got any answers from them yet. If I renew my passport now it will be too late because it will take 8 to 12 weeks until I get my new passport. Hi Craig. That’s quite a situation. If it’s really important to go home in December, the best thing you could do is to renew the passport in the Philippines. But I’m not sure that you can get it before the scheduled flight on January 7, 2018. You may also reach out to the Department of Foreign Affairs on Facebook for more advice regarding your trip.